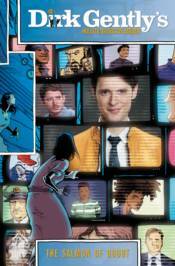 Dirk Gently, created by Douglas Adams, and currently the star of his own television series from BBC America returns to comics by the executive producers of the show, Arvind Ethan David and Max Landis. Plagued by nightmares about a childhood he never had, Dirk returns to Cambridge University to seek the advice of his former tutor, the time-traveling Professor Reg Chronotis. There he discovers that a holistic detective can have more than one past, and his adventures have only just begun. Featuring fan-favorite characters from the original books as well as the cast from the TV series, including Samuel Barnett and Elijah Wood. Collects issues # 1-5!